The “lesbian baby boom” in the 1980s not only changed the dynamics of childbearing and parenting, it also introduced a new set of legal questions and challenges for families. How could parents best protect children if only one was a legal parent? Could a non-biological parent establish a legal relationship with a child she or he was raising? In GLAD’s 1993 case, Adoption of Susan and a companion case, Adoption of Tammy, the Massachusetts Supreme Judicial Court ruled that the unmarried partner of a child’s biological parent can adopt the child and become a second legal parent without the biological parent giving up his or her rights. 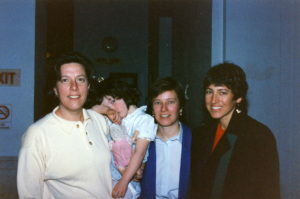 The plaintiff couple in Susan, Maureen Brodoff and Ellen Wade, had been together for 13 years when in 1989 Maureen gave birth to their daughter Kate. By Kate’s fourth birthday, Maureen and Ellen were fully immersed in the day-to-day lives of working moms. But even though Ellen did the hard work of being a parent, as far as the law was concerned she and her daughter were strangers. GLAD filed a joint petition on behalf of Maureen and Ellen in the Massachusetts Probate and Family Court, in which both parents sought to adopt Kate. After the judge denied the petition, GLAD appealed to the Massachusetts Supreme Judicial Court, which heard the case in May 1993. On September 10, 1993, the SJC issued its ruling allowing Ellen to adopt Kate.